The plot here is a touch more serious, though. The phone you’re in control of isn’t yours, but is that of a suspected terrorist. After being contacted by an unknown, mysterious government employee, you’re directed around the owner’s private details via social media apps—that replicate the likes of Facebook, Twitter and Instagram—and are then ordered to uncover sensitive information found in email accounts and text message conversations. 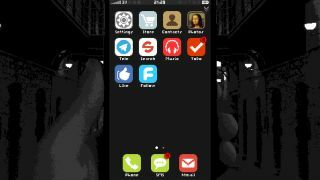 As you delve deeper into the game, sifting through seemingly genuine and innocuous chatter between someone else’s friends and family becomes slightly unnerving—even considering the game's terrorism context—and calls into question the wider implications of surveillance and breaches of privacy. It’s an interesting idea and one which really gets you thinking. Replica is out now on Steam and Itch for £1.99/$2.99/2,99€.